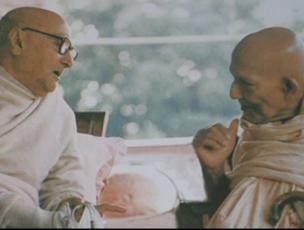 Last Friday, on 12th August 1988 on amavasya-tithi at 5:48 am in the morning – the principal stalwart personality, dear associate and follower of Nitya-lila Pravista Prabhupada 108 Sri Srimad Bhaktisiddhanta Sarasvati Gosvami Thakura who preached the pure devotional instructions of Sri Sri Gauranga Mahaprabhu worldwide, namely Sri Srimad Bhakti Raksaka Sridhara Deva Gosvami Maharaja, the principal acarya of Sri Caitanya Sarasvata Matha situated in Kolarganj at Sridhama Navadvipa, at the age of 93, entered into the eternal pastimes of Sri Sri Radha Govinda-sundara amidst a maha-sankirtana of intense separation performed by his own associates and devotees. The news of his disappearance has been announced everywhere in India and outside of India in the western world via the medium of telephone, radio and newspaper. Hearing the news of the disappearance of Pujyapada Maharaja, the servants of Sri Caitanya Gaudiya Matha were immersed in deep sorrow. He was the senior godbrother of the most worshippable founder-acarya of Sri Caitanya Gaudiya Matha, Nitya-lila Pravista Tridandi Gosvami Sri Srimad Bhakti Dayita Madhava Maharaja. He was the very intimate friend of Pujyapada Madhava Maharaja. They preached the message of Prabhupada together in many places in India. Srila Prabhupada, with the help of his own associates such as Nitya-lilia Pravista Srimad Bhakti Saranga Gosvami Maharaja, Srimad Bhakti Hrdaya Vana Maharaja, Srimad Bhakti Dayita Madhava Maharaja and Srimad Bhakti Raksaka Sridhara Maharaja, established various mathas/temples as permanent preaching centres in various parts of India for spreading the message of Sri Sri Gauranga Mahaprabhu. Because of our extreme misfortune, one by one, all the supremely bright stars of the Sarasvata Gaudiya firmament are enacting the pastime of disappearing from this world and in this way they are immersing the Gaudiya sky in deep darkness. Alas! Slowly we are becoming bereft of own protectors and masters. Again, a deep darkness seems ready to eclipse the sun-like pure devotion. Sriman Mahaprabhu asked, “Of all miseries, which is the worst?” Answering this question through the speech of His own intimate associate Srila Ramananda, He said, Krsna bhakta viraha vina dukha nahi dekho para (“There is no sorrow greater than the sorrow caused by the separation from Krsna's devotees”). It is true. Being separated from Krsna's devotees causes endless grief and has no consolation! Apart from the devotees of the Lord who are an ocean of mercy and most compassionate to those suffering people whose very life is Krsna, who else can try to save the living entities that are bereft of Krsna by telling giving krsna-katha and helping them to find Krsna? Who else will try selflessly to drive away the darkness of ignorance in which a fallen living entity like myself, blinded by illusion and in a perilous condition of life is situated? Bhakti is the supreme dharma of any living entity, but bhakti becomes contaminated if apa-siddhanta enters it, leading to a rise of adharma. To eradicate such degraded dharma and to re-establish proper dharma, Sri Bhagavan, with His own associates, appear in every age. Sometimes He also sends His devotees to preach proper dharma, and in this way reveals His mercy to the living entities. That is why the most merciful Sri Gaurahari has sent His own associates one by one, such as Sri Srila Prabhupada Sarasvati Gosvami Thakura, and again, in contemporary times, He has sent His own associates such as Pujyapada Sridhara Maharaja, Madhava Maharaja and other venerable personalities to perform the work of re-establishing proper dharma. But alas! Today, with the passing of time, they have become unmanifest and we are completely without shelter! Oh Gaurasundara, please protect us! Pujyapada Sridhara Maharaja has surely attained shelter at the holy feet of the most worshippable Prabhupada and is engaged in his eternal worship. We pray earnestly at his holy feet that, from there, he may cast his holy glance a little upon we who are fallen and lowly. Pujyapada Sridhara Deva Gosvami Maharaja performed his appearance pastimes on Saturday 26th of the month of Asvina in the year 1895 in the village of Hapaniya, near the Patuli railway station on the Katwa line. The village of Hapaniya belongs to the sub-division of Kalna in the Burdwan district. He accepted Sriyukta Upendra-candra Bhattacarya Vidyaratna as his father and Srimati Gauridevi as his mother on that auspicious day of his appearance. Both of his parents were pious, religious and dedicated to the Supreme Lord. They named their jewel-like son Sri Ramendra-sundara Bhattacarya. During his student life, when he was studying law, after passing B.A from Calcutta University, he joined the Non-cooperation Movement at the call of Mahatma Gandhi. Later in the year 1923, when he came under the merciful glance of the most worshippable Sri Srila Prabhupada at the Gaudiya Matha located at Ultadanga Junction Road. he accepted the good fortune of hearing hari-katha from him and discovered the real purpose of human life. He used to hear very attentively to whatever Prabhupada used to say. Very soon, in 1926 in the month of December, he exclusively joined the above Sri Gaudiya Matha and Sri Srila Prabhupada showering him special affection. Then, in the month of Vaisakha, he was given initiation into the maha-mantra, and on the 23rd of the month of Sravana, he accepted mantra-diksa as per the rules of pancaratrika system. The name he was given at initiation was Sri Ramananda Dasa. It was observed that he had exclusive dedication to sadhana/bhajana and a genuine attraction to serve Sri Guru and the Vaisnavas based upon following the inner thinking of Prabhupada in order to present the siddhanta of genuine sastras with very unique expertise. Seeing all the aforementioned qualities, soon, around the year 1930, he was given tridandi-sannyasa dress. His sannyasa name was given as Tridandi Bhiksu Srimad Bhakti Raksaka Sridhara. In fact, today he has become worshippable by the entire world by fulfilling the name he has given by his master. All good qualities befitting a Vaisnava were present in him. One attains the grace of the Lord only by the grace of the guru. All the demigods and their good qualities reside within one who has unalloyed devotion to the Lord. Despite his birth in a high brahmana family, we never saw him expressing any pride on account of his aristocratic lineage, opulence, scholarship, divine fortune etc. at any time in his matha life. In many big debates and conferences, where many acclaimed personalities participated, it was very wonderful to observe how he always maintained a calm, focused, solemn manner while establishing proper devotional conclusions and cutting asunder wrong conclusions that are averse to the words of pure devotional scriptures.Hearing from his holy mouth the wonderfully logical explanations imbued with devotion on scriptures such as Srimad Bhagavad-gita, Bhagavatam etc as well as his lectures delineating pure devotional conclusions, many pious essence-seeking people had the good fortune to perfect their lives by taking shelter at the holy feet of jagad-guru Srila Prabhupada. Each of his lectures was like a thesis. If someone could note them down, they could get a doctorate degree – the highest degree within the society of scholars. In the Garuda Purana it is declared that the Srimad Bhagavata is the natural commentary on the entire mother of the Vedas, the Brahma-gayatri. 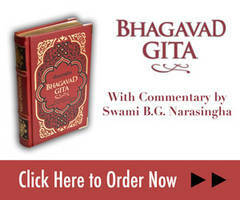 Based upon this, under the guidance of and allegiance to the Bhagavata, he revealed a wonderful nectarean explanation revealing sri radha-padam dhimahi within the Brahma-gayatri, which has been especially honoured by those highly learned people in society that are expert in the transcendental science of aprakrta-rasa. How can there be any other way to obtain the lotus feet of Krsna other than exclusive dedication to His hladini svarupa-sakti which has been spoken of in the Bhagavata verse, ananya-radhito nunanam. Krsna is worshipped by taking shelter of the hladini svarupa-sakti? This only is the worship of the Husband of Lakshmi, following in the footsteps of the Vraja-Gopis. This is the only advice of a spiritual master who is an ardent follower of Svarupa Damodara Gosvami and Rupa Gosvami. If one follows and chants this instructive mantra, then the witch of maya will flee in fear. This itself has been hinted in this sentence, dadami buddhi yogam tam yena mam upayanti te (‘I continue to bestow upon them devotional inspiration by which they may come to Me’). This is the pure steady intelligence for attaining eternal service at the lotus feet of the Supreme Lord which are the very object of attainment being prayed for to gayatri, the mother of the Vedas. In the heart of Pujyapada Maharaja, such an explanation has wonderfully manifested by the mercy of his spiritual master Sri Varsabhanavi Devi Dayita Dasa, who is the eternal associate of Sri Radha. When such a perfect meaning can be found on the basis of the laksana-vrtti, why is there any necessity of speculating about the harda-brahmatva (impersonal interpretation) of the word ‘syama’? Thus, if one obediently follows the meaning of sri radha-padam-dhimahi, one will achieve the lotus feet of Sri Radhanatha-Syamsundara. Only He is the supreme truth. Therefore, Srila Sridhara Maharaja's purport to the gayatri and its meaning is becoming victorious in every respect. Almost every senior sannyasi, brahmacari, grhasta, vanaprastha and servant of our Gaudiya Matha mission used to honour Pujyapada Sridhara Maharaj appropriately, and used to feel joy in discussing spiritual topics with Maharaja who was highly experienced and advanced in bhajana. Even nitya-lila pravista pujaniya Tridandi Gosvami Srimad Bhakti Prajnana Kesava Maharaja, the founder of Sri Devananda Gaudiya Matha situated at Tegharipara in Sridhama Navadvipa and nitya-lila pravista pujyapada Tridandi Goswami Srimad Bhakti Saranga Gosvami Maharaja also accepted tridandi-sannyasa vesa from Srimad Bhakti Raksaka Sridhara Deva Gosvami. During his manifest time in this world, that personality who preached the message of Sri Caitanya and established many mathas/temples in the Western countries, who accepted tridanda sannyasa vesa from Pujyapada Kesava Maharaja and became world-famous by the name Tridandi Svami Srimad Bhaktivedanta Svami Maharaja, also used to specially honour Pujyapada Sridhara Maharaja, considering him as his senior godbrother and highly experienced in bhajana. He used to come time to time to meet him personally and used to get unlimited transcendental bliss hearing krsna-katha from Srila Sridhara Maharaja. Pujyapada Maharaja became specially learned in the Sanskrit language along with English during his student life under the astute guidance and instruction of his guardians. He was born in a family with a well-reputed scholastic lineage. At very young age, his natural talent for composing poems etc. in Sanskrit was observed. At the shelter of the holy feet of the most worshippable Prabhupada, his perfect god-given potency further blossomed. During his manifested pastime in this world, Srila Prabhupada used to sometimes recite the slokas composed by Sridhara Maharaja, especially Srimad Bhaktivinoda-Viraha Dasakam and felt very pleased with him. He also composed Sri Sri Prabhupada-padma-stavakam, Sri Dayita Dasa Pancakam, Sri Sri Dayita Dasa Dasakam and Sri Sri Prabhupada Pranati – in such stotras one can easily understand the kind of intensity of his affectionate devotion towards the lotus feet of his guru. Apart from this his compositions he also wrote Srimad Gaura-kisora Namaskara Dasakam, Srimad Rupa-pada-rajam Prarthana Dasakam, Sriman Nityananda Dvadasakam, Srila Gadadhara Prarthana, Rg Tatparyam,Sri Gayatri Nigudhartham, Sri Prema-dham-deva Stotram, Sri Gaurasundara Nutisutram etc/ These verses have been very much honoured and appreciated in the Sri Gaudiya Vaisnava society. The abovementioned stotras were chanted and relished with great affection by Sri Srila Prabhupada's own men Nitya-lila pravista bhajananandi Vaisnava-pravara Sripada Krsna Dasa Babaji Maharaja and Tridandi Gosvami Sripada Bhakti Vicara Yayavara Maharaja during their manifested presence in this world. They were especially very appreciative of his qualities. In his jewel-like prayer named Prema-dhama-deva Stotram, almost all of the pastimes of Mahaprabhu’s Adi, Madhya and Antya-lilas have been briefly described and remembered. If this stotra is published with an amnaya, tika, and anuvada as a separate book, then it will self-manifest as a great devotional work for reading and studying daily. His composition in Bengali, aruna vasane sonara suraja is chanted on the day of Sri Gaurasundara's appearance. Songs such as sarasvata-arati etc are being chanted by the Vaisnavas with great affection. Under the editorship of Pujyapada Maharaja, the entire text of Sri Srila Rupa Gosvamipada's Bhakti-rasamrta-sindhu (main slokas, tika, amnaya and Bengali translation) has been published. Apart from this, Sri Prapanna jivanamrtam (slokas written by Maharaja himself, with Bengali translations), Srimad Bhagavad-gita (main slokas, anmaya with Bengali translation), Sri Siksastakam, Suvarna Sopana (The Golden Staircase), Sri Guru and His Grace, Sarasvata sukha-niketana, Sri Bhakti Raksaka Divya-vani, Sri Bhakti Raksaka Hari-kathamrta, Premamaya Annesan, Sri Gaurasundera Vipralambha Lilara Samahara etc. are a few books that have been published in Bengali as well as in the English language. These books have been specially welcomed with high appreciation and they have been preached very extensively far and wide. It is of great joy to us that, being attracted by the pure devotional sermons (suddha-bhaktisiddhanta-vani) from the holy mouth of Pujyapada Maharaja, many good people that are essence-seekers from the western world, after coming to Sri Caitanya Sarasvata Matha in Sridhama Navadvipa, have achieved the good fortune of obtaining shelter of Maharaja's holy feet. His instructional sermons, while he was reclining or lying down were recorded and later published in the form of books. All those books have been especially honoured in the English-speaking western literary and learned societies and by their heartfelt enthusiastic endeavour, a few preaching centres have been established in specific western locations like London etc. In those preaching centres, the pure devotional conclusions and instructions of Sri Srila Prabhupada are preached on a massive scale in various languages. Even by staying in one place – prthivite ache jata nagaradi grama, sarvatra pracara haibe mora nama – he miraculously fulfilled the prophesy of the words spoken by Sriman Mahaprabhu. In India, he has established Sri Caitanya Sarasvata Matha (Navadvipa), Sri Caitanya Sarasvata Asrama (Hapaniya, Bardhaman), Sri Caitanya Sarasvata Krsnanusilana Sanga (in Svargadvara at Puri, Dumdum Park and Dumdum Airport). In those places, preaching centres have been established and the activity of preaching the words of Sri Caitanya are being undertaken there. Presently, Pujyapada Maharaja has appointed his disciple, Parivrajakacarya Tridandi Svami Srimad Bhakti Sundara Govinda Maharaja as the president-acarya of those mathas. On the day before his disappearance, the most worshippable Sri Srila Prabhupada bestowed his mercy upon him by expressing the desire to hear songs like Sri Rupa Manjari-pada, sei mora sampada sei mora bhajana-pujana composed by Srila Narottama Thakura Mahasaya, from the holy mouth of Pujyapada Sridhara Maharaja. Pujyapada Maharaja took the merciful blessings of the most worshippable Prabhupada upon his head and has tried with all his heart and soul till the time of his disappearance to fulfil the desires of Sri Svarupa-Rupanuga-vara Prabhupada. Srila Prabhupada even said a few days before his disappearance, “The line of Bhaktivinoda will never be obstructed. All of you dedicate yourselves with great enthusiasm to preach the innermost desires of Sri Bhaktivinoda.” Thakura Srila Bhaktivinoda is a mahajana in the line of the followers of Sri Rupa (rupanuga-vara-mahajana). The most worshippable Prabhupada established the great ideal of fulfilling his heart’s desire. His own associates, who are under the shelter of his holy feet such as Pujyapada Tirtha Maharaja, Gosvami Maharaja, Madhava Maharaja, Vana Maharaja, Yayavara Maharaja, Krsna Dasa Babaji Maharaja and Sridhara Maharaja etc. and other Vaisnava acaryas, having followed that ideal, have been accepted amongst the associates of Rupanuga Prabhupada. At this moment, those who are servants of the servants of Sri Srila Prabhupada and his eternal associates have to firmly nurture the great hope and desire to fulfil the mission and wish of their spiritual master. In this regard, our only strength and shelter is the foot dust, foot water and remnants of the Rupanuga Vaisnavas. Pujyapada Maharaja disappeared from this world on 12th August at 5:48 in the morning, but before that, from the 5th August he took refuge in mauna-mudra (abstaining from speech) and completely dedicated his mind deeply to the lotus feet of His worshippable Sri Sri Guru-Gaura-Radha-Govindasundara, accepting the last sojourn of leaving his body. The manner in which his servants from eastern and western countries earnestly dedicated themselves to serve his holy body day and night is inconceivable to understand and very exemplary. Following the ideals of the service performed by Sri Srila Isvara Puripada during the disappearance pastimes of Sri Srila Madhavendra Puripada, a few boys belonging to Gaudadesa, especially a boy named Tapana, very mystically served their guru with full surrender of body, mind and words and have received the unlimited mercy and blessings of their Gurudeva. Four days before the disappearance day of Pujyapada Maharaja on Monday, 8th August, by divine arrangement, Srimad Bhakti Pramoda Puri Maharaja received the good fortune of coming to Sri Caitanya Sarasvata Matha to have darsana of Pujyapada Maharaja and stayed there till the time of his disappearance. From time to time he honoured the good fortune of close association to the lotus feet of Pujyapada Maharaja and had the opportunity to do some service for him. After his disappearance pastimes took place, he was taken from his room on the second floor on his bed accompanied by sankirtana to the temple courtyard of his worshippable Deities Sri Sri Guru-Gauranga-sundara-Radha-Govinda-sundara Jiu, and there, for a long time maha-sankirtana was performed. After 11:41, we took him to the north side of the temple courtyard under the tulasi tree and bathed his body with Ganges water and, after bathing, applied ghee to his body, performed maha-snana with the recitation of mantras and dressing him with new cloth, tilaka was applied on his body, along with writing the samadhi mantra on the chest, based upon the rituals detailed in Samskara-dipika. After that, at the north side of the temple in a seven-foot hole in the ground, he was seated facing east and maha-puja was performed with sodasopacara (the offering of sixteen items), then offering mahaprasada, arati, an offering of prasadi garlands and sandal oil. With maha-sankirtana and amidst the loud sounds of ‘Jaya’, the samadhi was performed with salt and earth. All these ceremonial activities were performed under the priestly guidance of Srimad Bhakti Pramoda Puri Gosvami Maharaja. Srimad Govinda Maharaja wrote the samadhi mantra on the chest of Pujyapada Maharaja and during that time also sang Sri Rupa-manjari-pada and other songs that were dear to Maharaja. From almost every matha in the city of Navadvipa and Mayapura, Vaisnavas came to offer garlands to Pujyapada Maharaja. By the time the rituals and the samadhi ceremony was completed, it was past 1 pm. In the holy temple of the Lord, when the puja, the offering of bhoga and arati had ended, the assembled devotees were welcomed with maha-prasada. Srimad Puri Maharaja, along with Sriman Dayala-Krsna and Gopinatha Dasa Brahmacari, stayed that day in the Kolerganj Matha and after passing that night, the next morning they returned to Gopinatha Gaudiya Matha situated in Sridhama Mayapura. Today we are also immersed in an ocean of sorrow after losing one of the most worshippable associates of Prabhupada. His position cannot be filled in any way. A Vaisnava is adosa-darsi (one who finds no fault). We pray earnestly with the deepest humility at his holy feet that Pujyapada Maharaja forgives and corrects all our offences, shortcomings made either knowingly or unknowingly and that he bestows his true mercy upon us. He has now been recruited in the eternal service of Sri Srila Prabhupada. May he kindly bestow upon us the right to serve the lotus feet of Srila Prabhupada and his companions, and in this way deeply oblige us. We submit this prayer to his lotus feet.